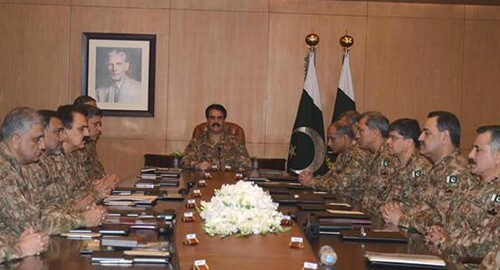 ISLAMABAD (92 News) – COAS General Raheel Sharif presided over the Corps Commanders Conference at GHQ on Wednesday. The conference was briefed on prevailing and emerging threats and ongoing security and intelligence agencies operations across the country. Speaking on the occasion, COAS General Raheel Sharif reiterated zero tolerance for terrorist organizations. He directed all concerned to continue focused efforts till achieving sustainable peace and security. The COAS lauded international agencies’ recent phenomenal success in IBOs in breaking terror nexus across country and disrupting their support mechanism.